Is there anything as cooling as chocolate mint ice cream on a hot summer’s day? This refreshing dairy-free chocolate mint ice cream with essential oils is free of eggs and refined sugar, too. Yet still full of mint flavor, thanks to peppermint essential oil. Finally, normal chocolate chips get hard and crunchy when frozen, yet these chocolate chips melt in your mouth. How? They are created by melting chocolate with coconut oil. Then the mixture is drizzled into the ice cream during the last minutes of churning. It's definitely worth the effort! 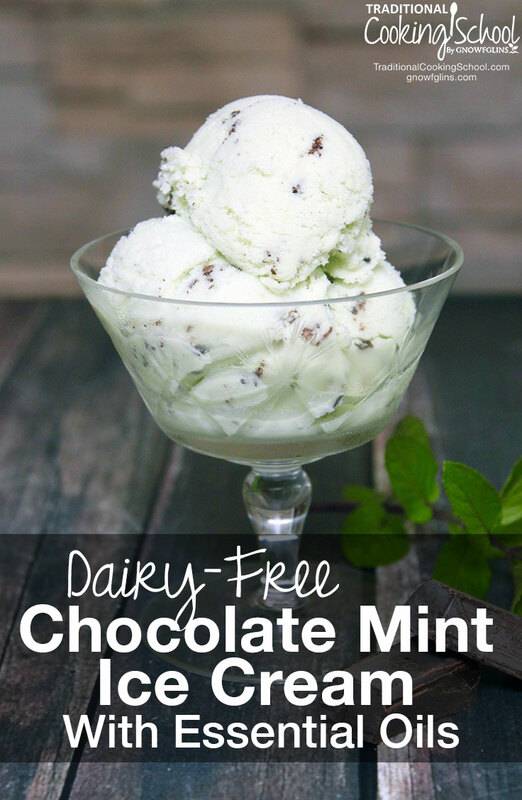 This refreshing dairy-free chocolate mint ice cream with essential oils is free of eggs and refined sugar, too. Yet still full of mint flavor, thanks to peppermint essential oil. The gorgeous green color? That's due to spinach! Shhh... don’t tell! 😉 Makes 4 cups (1 quart). Blend coconut milk and spinach until smooth. Then pour all but 1/4 cup of the mixture into a pot and heat over medium heat. Combine the reserved 1/4 cup with arrowroot powder. Next, whisk until completely dissolved. Pour into the warm milk and whisk to combine. Continue to whisk until mixture thickens. With arrowroot, this happens right as it starts to boil. Next, let cool for a few hours in the fridge. When cold, churn according to the directions for your ice cream maker. Finally, once ice cream is churned and chocolate is drizzled in, remove ice cream from the ice cream maker and freeze until firm. In a double broiler, or a bowl over a pan of simmering water, melt the chocolate. Then stir in coconut oil until melted and combined. Add honey, if using unsweetened chocolate. Let cool but don't allow to harden. Finally, in the last few minutes of churning, drizzle chocolate into the ice cream. It will freeze and create little chocolate chunks throughout. *I prefer to melt an unsweetened chocolate bar. That way I am not only in control of how much sweetness, but also what kind of sweetener. For a bitter chocolate, add 1/2 tablespoon honey. Or for a semi-sweet, add the full 1 tablespoon. *For a fresh mint twist, add a small handful of fresh mint into the blender with the spinach and coconut milk. *Or, add a heaping tablespoon of dried mint (or a handful of fresh mint) to the warm coconut milk. Let steep for at least 20 minutes. 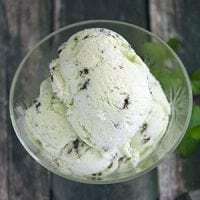 Strain out the mint, and continue with the recipe as written -- except with a Steeped Mint Chocolate Ice Cream! *Don’t have peppermint essential oil? Add 1 teaspoon of peppermint extract. Or, use either of the variations above. Have you ever made ice cream with essential oils? What's your favorite ice cream flavor to beat the summer heat? 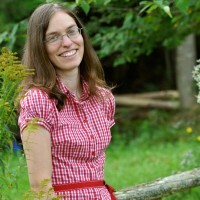 This post was featured in 27 Recipes With Essential Oils and 92 Nourishing Grill & Barbecue Dishes, Drinks, & Desserts. Disclaimer: At Traditional Cooking School, we recommend using only pure, therapeutic grade essential oils and those generally recognized as safe (GRAS) by the Food and Drug Administration. The information provided by this website is intended for educational and informational purposes only. This post or the essential oils mentioned therein are not intended to diagnose, treat, cure, or prevent any disease. Please consult a qualified aromatherapist when using essential oils for any purpose. If you are pregnant, nursing, taking medication, or have a medical condition, consult your physician before using these products. Sounds delicious! I’m wondering if it would be possible to mix cocoa powder with the honey and coconut oil to replace the unsweetened chocolate. If so, what do you think the correct ratio would be? Thanks so much and looking forward to trying this ice cream! Hi Tami, I haven’t tried it this way, so I can’t say for sure how it would work. I always use this chart when I am trying to substitute chocolate: http://whatscookingamerica.net/ChocolateSubstitutionChart.htm which indictes that 3 tablespoons of cocoa powder plus 1 tablespoon if butter (coconut oil should work, too) would substitute for the chocolate. If you try it, let us know how it works! This recipe looks good! I don’t have an ice cream maker and don’t see the need to buy one for an occasional recipe, any thoughts on 2nd best way to do it? wow!!! I haven’t made yet… but just reading ingredients sounds awesome!!! Fantastic! So excited to try this. With egg allergies in the house and a mama who just recently learned she isn’t supposed to have dairy (except the occasional bit of cheese), this recipe is a blessing! I just got a new ice cream maker, AND I happen to have all these ingredients! Can’t wait to try it! I made this recipe for a party and it was a HUGE hit! Everyone requested that I make it again. Thanks for sharing.